Jean-Luc Picard was born in La Barre, France on Earth to Maurice and Yvette Picard on July 13, 2305. He and his elder brother, Robert, spent their childhood tending to their family vineyards with their father. Concerned about the preservation of their familial values, Maurice and his wife educated their sons in the ancient traditions, avoiding, in particular, any superfluous technologies. As a young boy, Jean-Luc watched his grandfather "deteriorate from a powerful, intelligent figure to a frail wisp of a man, who could barely make his own way home." As a child, Jean-Luc took piano lessons but eventually gave it up because he dreaded performing in front of an audience. In his later life, he would regret doing so because his playing used to please his mother. Young Jean-Luc dreamed of adventure and exploration. He was fond of starships, of which he liked to build models. Moreover, he was captivated by the Phoenix, the first Human warp-capable starship, which he admired several times at the Smithsonian Institution. Like his nephew René, Jean-Luc wrote a ribbon-winning report on starships. Although Maurice intended his sons to work at the vineyards, it was obvious that since very early Jean-Luc knew he wanted to join Starfleet, something that his father would never condone, up until his death. Jean-Luc would later remember that he devoted his childhood for that end, which was like skipping that age altogether. His brother would later note that Jean-Luc always sought higher standards, such as becoming president of his school and later a valedictorian and even an athletic champion. Robert was also jealous seeing Picard being the favored son and getting away after his mischiefs. Sometimes Robert had to bully his younger brother. Jean-Luc caused "quite a stir" by leaving his family's generational vineyard and applying to Starfleet Academy. Although he failed to gain entry on his first attempt, Picard succeeded in his second attempt in 2323. He subsequently became one of the most outstanding cadets in his class. Picard's career at the Academy was difficult, at best – years later, Picard credited Academy groundskeeper Boothby with helping him develop a mature attitude. Among Picard's friends at the Academy were Donald Varley, Cortan Zweller, Marta Batanides, and an acquaintance called "A.F. ", whom he blamed for his failed semester of Organic Chemistry and whose initials Picard carved into Boothby's prized elm. At the Academy, Picard developed an interest in archaeology. His professor, Richard Galen, encouraged him to continue in this field, but Picard ultimately refused his offer of becoming an archaeologist. He would nevertheless keep his interest in the subject, and became to be considered quite knowledgeable in the field. Picard also excelled in sports. He won the Starfleet Academy marathon in April 2323 on Danula II, becoming the first freshman to win the race. During a wrestling match, Picard caught a Ligonian with a reverse body lift and pinned him down in the first fourteen seconds. During his sophomore year, Picard was assigned to training on Morikin VII where he had his first encounter with Nausicaans, who had an outpost on a nearby asteroid. Shortly upon graduation in 2327, Picard's promising career nearly ended abruptly during a layover at Starbase Earhart. During a bar brawl over a rigged game of dom-jot, he was stabbed through the heart by a Nausicaan, and had to undergo emergency surgery to replace his heart. He later related to Wesley Crusher that he laughed after looking down to see the knife protruding from his chest. This event helped him realize how fragile life could be, and thus made him more willing to take risks and make his mark in the universe, which he only realized when Q proposed him to change this event in 2369. As an ensign, Picard was posted to the USS Reliant, where he served with Lieutenant Nakamura. As a junior officer, Picard was the closest of friends with Walker Keel, and also became friends with Jack Crusher and his fiancée, Beverly Howard. In 2328, Picard was granted a special shore leave to run an elite, long-distance race on a barren planet in the Elyrion system. Unfortunately, he did not finish in the top five. However, during his time on the planet he befriended a young Zartani named Nuadra Demmix, and also gained experience with the Ubarrak. Picard demonstrated command abilities early in his career, in particular, when he led an away team on Milika III to save an ambassador. This incident would later be mentioned by Q as one of the crucial events forming Picard's personality. As a young lieutenant, Picard attended the wedding of Sarek's son, where he briefly met Sarek and Spock for the first and only time before the 2360s. In 2333, Picard was a lieutenant commander, and second officer of the USS Stargazer under the command of Captain Daithan Ruhalter. The Stargazer was ordered to investigate the threat of a Nuyyad attack from beyond the galactic barrier. After crossing the barrier, the Stargazer was attacked and crippled by the Nuyyad, which left Captain Ruhlater dead, and first officer Commander Stephen Leach in a coma. Picard assumed command and got the Stargazer to safety at Magnia colony. While undergoing repairs at the colony, the Stargazer's crew, uncomfortable with such an inexperienced commander, mutinied. Picard managed to quell the mutiny and appointed Lieutenant Gilaad Ben Zoma as first officer and Lieutenant Vigo as tactical officer. With the mutiny resolved, Picard had the Stargazer refitted with enhanced Kelvan weaponry and defended the Magnians from a Nuyyad attack and destroyed one of their weapons depots, before returning to Federation space. Following the successful completion of the mission, Admiral Mehdi promoted Picard to captain and placed him in permanent command of the Stargazer. Following the Nuyyad encounter, Stargazer proceeded to Starbase 32, where Picard and Ben Zoma attended a meeting of Starfleet captains and admirals. Admiral Arlen McAteer ordered Picard to find and apprehend the pirate known as the White Wolf, who had been haunting the Beta Barritus system. The Stargazer succeeded in traversing the systems, magnetic vortex belt while tracking White Wolf, but instead encountered the Constellation-class USS Cochise. Captain Greenbriar of the Cochise informed Picard that White Wolf was actually the famed exobiologist Emil Carridine, who was protecting a Prime Directive world. Picard decided not to apprehend Carridine, but returned to Starbase 32 with White Wolf's cargo, which angered Admiral McAteer. Over the next few months, tensions between Picard and McAteer continued to mount. Following his failure to apprehend White Wolf, McAteer ordered the Stargazer to survey the Egreggedor system. Defying orders, Picard diverted the ship to Gnala at the request of his chief engineer, Phigus Simenon. The reptilian Simenon needed to return home so that he could participate in the traditional competition amongst males of his people that allowed the winner to be the one who fertilized the next generation of his clan's eggs. Picard first met the El-Aurian woman named Guinan while on an undercover assignment in the orbital city Oblivion. In the years that followed, Picard and Guinan would form a friendship that Guinan once described as, "Beyond friendship, beyond family". McAteer eventually held a competency hearing for Picard a few months later, but he failed to strip Picard of command, and Picard remained in command of the Stargazer. After the competency hearing, Admiral Mehndi assigned the Stargazer to a long-term mission of exploration in uncharted regions of space. In 2342, Picard dated a young woman named Jenice at the Café des Artistes in Paris. However, he became afraid of a possible future relationship and posted Jenice, who later married Paul Manheim. In 2343, Picard first met Lieutenant Elias Vaughn of Starfleet Intelligence. The two would meet several times over the coming years, including a coup on the planet Darnak VII. In 2348, Picard attended the wedding of Jack and Beverly Crusher in San Francisco. It was here that a Romulan spy named Manathas gathered the genetic material from Picard that was eventually used to grow the Picard-clone, Shinzon. During the Cardassian wars, the Stargazer was involved in a truce offering by the Federation. After making contact with a Cardassian warship, Picard lowered the ship's shields as a gesture of good will, but the Cardassian commander ignored the gesture and disabled the Stargazer's weapons and impulse engines. The Stargazer managed to regroup and flee. In 2354, the Stargazer was dispatched to the planet Xenex to talk with the Xenexians in an attempt to stop further bloodshed against the Danteri, who were seeking Federation membership. Picard and Jack Crusher met with a 19-year old warlord named M'k'n'zy of Calhoun. Picard was very impressed with M'k'n'zy, and he encouraged him to enter Starfleet Academy. In 2354, Picard was on an away mission when he saved the life of one team member at the expense of another; Jack Crusher was lost in the line of duty. Picard met with Crusher's widow, Beverly, on Starbase 32 to present the body; it was one of Wesley Crusher's earliest memories. In 2355, the Stargazer was seriously damaged in a battle with an unknown enemy vessel, later discovered to be a Ferengi ship. Picard managed to destroy the enemy vessel using the Stargazer's warp engines in a unique tactical maneuver (later named the "Picard Maneuver"), but was forced to abandon the Stargazer. His actions during the battle were called into question by Starfleet prosecutor Phillipa Louvois, but he was exonerated by the inquiry board and was later awarded the Grankite Order of Tactics (Class of Excellence) for the development of the Picard Maneuver. The encounter with the Ferengi vessel, later known as the Battle of Maxia, eventually came back to haunt Picard. DaiMon Bok, whose son was killed in the battle, twice tried to exact revenge on Picard. Following the court-martial hearings, Picard, who was feeling at ends following the destruction of the Stargazer, began to wonder if starship command was really for him. He decided to visit his former second officer Elizabeth Wu on the Hydra IV colony. Wu had left the Stargazer in 2336, but Picard had kept in touch with her over the years, and desired the perspective of someone who had been in Starfleet, but left it behind. Picard's craft crash landed on an uncharted and unexplored planet. There, he encountered a group of Rhitori, whose ancestors owed their freedom to the Stargazer responding to their distress call over 20 years prior. T he incident made Picard realize all the good that he had done, and could continue to do, as a starship captain. Picard decided to remain in Starfleet. Soon after, Picard began guest lecturing at Starfleet Academy, as well as transferring between numerous assignments. Picard also enrolled as a Ph.D. student in archaeology at the University of Alpha Centauri in 2355. Three years into this program, he was teaching an introductory class in archaeology when Guinan paid him a visit, and questioned whether he really wanted to avoid going back to commanding a starship. During his time at the University of Alpha Centauri Picard assembled a group of archeologists who wanted discovered some survivors of the ancient race of Manraloth. Picard fell in love with the first survivor they were able to rescue from a time stasis field. Not remembering her past, she accepted the name "Ariel." Picard and Ariel spent many months together putting together a team of Starfleet specialists who would eventually search for other Manraloth. Knowing that he could achieve their goal only with the help of Starfleet, Picard rejoined the fleet and was given command of the Miranda-class USS Portia. For this mission he recruited Lieutenant Data as his science officer. After they found other survivors, Picard realized that Ariel (who in the meanwhile regained her memory, and remembered her true name: Giriaenn) had tricked him by using his feelings for her. The Manraloth planned to destroy the Federation in order to save the galaxy. It took Picard three years to hunt them down, but in 2363, he lead a fleet of seven starships to prevent the Regnancy of the Carnelian Throne from accessing the Manraloth archive. The fleet, which was made up of the USS Cybele, USS Thelian, USS Tecumseh, USS Malinche, USS Victory, USS Puttkamer and the USS Nautilus, assembled in the Mirfak system before travelling at high warp to the Kirisha system where they engaged the Carnelian warships. The Manraloth realised that their plans were wrong and evolved into the next stage of being. Soon after that Picard accepted to take command of the USS Enterprise-D.
Picard hand-picked most of his senior staff, such as two young officers who impressed him enough upon first meeting. Geordi La Forge once piloted Picard's inspection tour shuttle and stayed up all night to refit an engine part Picard had made a passing comment on, and Picard witnessed Natasha Yar risk her life to save colonists amid a Carnelian minefield. He had also picked William T. Riker as his first officer and promoted him to commander sight unseen, impressed by the young officer's record of independence. Commanding the Enterprise on her first mission, Picard made first contact with a member of the Q Continuum – Q. Picard and his senior officers had to stand trial for Humanity's immaturity. To prove their worthiness as a species, Picard had to solve the "mystery of Farpoint Station." The crew of the Enterprise discovered that the inhabitants of Deneb IV, the Bandi, had captured a space-dwelling being to serve their own purpose. The Enterprise helped to free the creature, and Q, somewhat disappointed by the crew's success, retreated, though he hinted that it would not be their final encounter. Although Picard often heatedly defended a strict interpretation of the Prime Directive, he broke it numerous times when he felt it was warranted. Thus, in 2364, he allowed an Edo woman to confront her "god" from space and saved Wesley Crusher from a death sentence. Later that year, Q created a bizarre and deadly "game" for the crew of the Enterprise in order to demonstrate that he had given Riker Q-like abilities. Ultimately, Riker rejected these new powers, and Q again disappeared. In mid 2364, the Enterprise met with a Ferengi vessel in the Xendi Sabu system commanded by one DaiMon Bok. Bok presented the long-lost Stargazer as a gift to Picard. Bok claimed to have found the starship adrift. Bok was actually the father of the Ferengi DaiMan defeated by Picard at Maxia-Zeta all those years prior, and his 'gift' was actually part of an elaborate plan of revenge. Bok was arrested by his own crew for engaging in such an unprofitable venture as revenge. Following Natasha Yar's death in 2364, Data was puzzled about her death, thinking not about Tasha but rather how he would feel in her absence, thinking that he missed the purpose of her memorial, but Picard assured him that he understood the purpose of the memorial perfectly. The Enterprise was present when the Romulans returned to the galactic stage in late 2364, after a 53 year absence, since the Tomed Incident of 2311. In 2365, Data's existence was threatened when Commander Bruce Maddox wished to disassemble and study Data to gain a better understanding of how his positronic brain functioned. Data refused to submit to Maddox's procedure, finding his research flawed, but Maddox claimed that Data was property of Starfleet and therefore not a sentient being and as a result had no choice other than to submit to the procedure. Captain Phillipa Louvois supported Maddox's claim, and Picard intervened by challenging their reasoning, saying that Data was indeed sentient and deserved the freedom to make his own decisions. He also said that Data represented an entire race and that forcing him to submit to Maddox's procedure is tantamount to slavery – strictly against Federation law. Ultimately, Louvois sided with Picard's standpoint and agreed that Data, android or not, was indeed sentient and entitled to the same rights as any other Starfleet officer. Q first expressed an interest in joining Picard's crew. When Picard declined, Q tried to show how much he could be of assistance by hurling the Enterprise into the path of a Borg cube. Q was hoping to show that the Federation was entirely unprepared to meet some of the more powerful races that existed in the universe. Ultimately, Picard had to beg for Q's help in escaping from the pursuit of the Borg vessel. When Ambassador Lwaxana Troi visited the USS Enterprise-D in 2365, she had just entered her Betazoid phase, and so she set her sights on several male crewmembers as potential mates, including Picard. She announced her "wedding" with William Riker on the bridge of the Enterprise shortly before moving on to Picard. Following an intimate dinner with the ambassador, Picard hid himself on the holodeck in a Dixon Hill holonovel. A fourth encounter with Q occurred in 2366, when the other members of the Continuum had stripped him of his omnipotence and immortality as punishment for his irresponsibility. He sought refuge on the Enterprise and, although Picard and the rest of the crew were initially unconvinced of the sincerity of Q's pleas, the captain agreed to provide Q temporary asylum. As the Enterprise began to suffer from Calamarain attack, however, Q resolved to end his life in order to prevent further risk to the Enterprise crew, but another member of the Q Continuum prevented Q from sacrificing himself, and restored his powers as a reward for his selfless act. In 2366, a duplicate of Picard replaced the captain in order to learn about Human relationships. The impostor had all of the memories and experiences of Picard but his behavior was different from the captain. He was more outgoing and especially flirtatious with Doctor Crusher, inviting her to dinner, where the two had a romantic evening, including dancing. However, once the duplicate had enough information, it unceremoniously bade Crusher farewell. She teasingly held the real Picard responsible for his duplicate's actions when he was returned to the Enterprise. In 2366, the Klingon High Council accused Mogh, the deceased father of Lieutenant Worf, of treason. Picard, understanding the severity of the charges and their implications for Worf, had the Enterprise change course to Qo'noS. Worf's brother Kurn initially served as his Cha'DIch, but after an assassination attempt left him in critical condition, Worf asked Picard to take up the role. Picard initially declined, saying that there were younger, more able men on the ship from which Worf could choose. However, Worf insisted that there was no one he would rather have at his side. Picard accepted and stood by Worf when the conspiracy against his family was uncovered. The Enterprise was assigned to transport Ambassador Sarek to Legara IV, in order to conclude his negotiations with the Legarans, which took nearly 100 years to complete. During the voyage it was discovered that Sarek had contracted Bendii Syndrome, and that his emotions were starting to control him. Picard volunteered to mind meld with Sarek, so that he could act as an emotional anchor for the Vulcan as he concluded the talks, which were successful. Lwaxana continued to teasingly flirt with Picard during her future visits to the Enterprise. On one occasion, Picard pretended to be in love with Lwaxana in order to save the ambassador's daughter, Deanna Troi, and Riker from Ferengi captivity. Lwaxana was most impressed with his Shakespearian poetry. Later in 2366, the Borg launched their first invasion of the Federation. A single cube destroyed the New Providence colony and the USS Lalo, and kidnapped Picard when the Enterprise attempted to intervene. Picard was partially assimilated and became a Borg drone known as Locutus of Borg. The cube proceeded towards Earth and engaged Starfleet in the Battle of Wolf 359, resulting in the destruction of 39 Federation vessels. On arrival at Earth, an away team from the Enterprise successfully rescued Picard and used his connection to the Borg to implant false data in the cube, destroying it. In 2367, Picard's seemingly unbreakable trust in Data was tested when Data refused to fully cooperate with an investigation into a number of events that happened within a 24-hour time span, although Data claimed that the time span was only 30 seconds. Data's intransigence threatened to end his Starfleet career and even his own existence, but it was later revealed that Picard was himself responsible for Data's unusual behavior after an encounter with the Paxans in a T-Tauri type star system. Late in 2367, Q returned to the Enterprise to "properly" thank Picard for his role in helping him regain his standing in the Continuum. At the time, Picard was meeting Vash, whom he had met on Risa the year before. Q resolved to teach Picard a lesson about love and cast the captain, Vash, and the Enterprise command crew into an elaborate scenario styled by the ancient legend of Robin Hood. Q himself assumed the role of the Sheriff of Nottingham. Ultimately, Picard learned his lesson, and everyone was returned to the Enterprise. Intrigued by Vash, though, Q offered to take her on a journey of exploration to explore various archaeological ruins of the galaxy, and she accepted. When the Klingon Civil War erupted in 2367, Worf resigned from Starfleet and fought on the side of Gowron against the forces of the Duras family. With the help of Picard, Worf and other Gowron supporters revealed Romulan assistance to the Duras cause. This collapsed support for the House of Duras, and Gowron won the chancellorship. Gowron restored the honor of the House of Mogh in thanks for its assistance during the war. Worf returned to Starfleet, but was reprimanded because he killed Duras in revenge. The Enterprise again encountered the Borg in 2368 when they rescued a Borg drone from a crashed Borg shuttle. This drone was cut off from the Collective and slowly regained an individual identity, eventually being named Hugh. Initially, the plan was drafted to use Hugh to destroy the collective in its entirety, although Doctor Beverly Crusher resisted the extermination of an entire race – even if it was the Borg. Picard eventually confronted Hugh, who immediately recognized Picard as Locutus. Picard took the role of Locutus while talking to Hugh, to simulate the authority that Hugh was used to. However, Geordi La Forge, Data, Doctor. Crusher, and other members of the Enterprise crew had a profound effect on the former drone. Even Guinan, who initially wanted nothing to do with Hugh, taught him that resistance is not futile. Guinan's homeworld had been destroyed long ago by the Borg, but the fact that Guinan was still alive was proof of this assertion. When Picard reminded Hugh that "resistance is futile," Hugh informed him that it was not so. When Picard told Hugh that La Forge would be assimilated, Hugh stated that La Forge did not want to be assimilated. When Picard said that this was irrelevant, Hugh specifically said that he (and Hugh used the word "I") would not assist in the assimilation of La Forge. Picard was stunned that a Borg drone would say such things. He decided that he could not send Hugh back with the file that would destroy the Borg. Picard offered Hugh asylum on board the Enterprise, but Hugh said that the Collective would not stop looking for him until they found him. Hugh agreed to go back to the crash site and to be taken back into the Collective, to protect the Enterprise from harm. In 2368, while mediating negotiations between the warring planets Krios and Valt Minor, Picard encountered Kamala, an empathic metamorph intended as a gift for Valtese Chancellor Alrik. Due to premature emergence from stasis, Kamala underwent her bonding phase before the marriage could be completed. When circumstances placed Picard and Kamala in close proximity to each other, she eventually bonded with the captain. However, having adapted to be perfectly compatible with Picard, Kamala found that her sense of duty demanded that she proceed with the marriage rather than pursue a relationship with Picard. Picard was deeply affected by Kamala, as shown by his reaction to Ambassador Briam's inquiry about the experience. In 2368, the Enterprise encountered a space probe of unknown origin, which emitted a nucleonic beam directly at Picard. This led to his fainting and awakening on an unknown world where he was known as an ironworker named Kamin and was married to Eline. Picard later found out that Kamin was a member of the Ressik community on a planet called Kataan. For five years, Picard clung to his life aboard the Enterprise and searched for ways to return, but eventually settled into his life as Kamin, having two children with Eline and eventually a grandchild. In the approximately 35 years Picard spent as Kamin, he learned to play the Ressikan flute, dabbled in astronomy, and analyzed soil samples from the planet, eventually confirming that Kataan was a dying world. Near the end of his life on Kataan, it was revealed to Picard that Kataan had been destroyed more than 1,000 years previously, and the residents of the Ressik community had engineered the probe to share the memory and experiences of their people with someone who could then teach others about their civilization. He awoke on the Enterprise as Jean-Luc Picard once more and discovered that he had lived a lifetime in only 25 minutes. The probe was collected by the Enterprise and disassembled. A Ressikan flute was found inside the probe, which Riker then presented to Picard. In 2369, Q once again appeared aboard the Enterprise, this time to instruct Amanda Rogers, a Human who was the child of two Q and possessed Q powers herself. Although Q's petulant and acerbic attitude did little to ingratiate himself to Amanda, he eventually convinced her to go with him to the Continuum to learn to use her new-found abilities. Later that same year, Q appeared to Picard when the latter was critically injured in a Lenarian ambush. Appearing as "God", Q told Picard that he had died because of his artificial heart, and offered him the chance to return to the incident in his youth, allowing him to relive the events leading up to his near-fatal injury and change history. Although Picard was successful in changing history, he eventually realized that the event – and his previous nature as an arrogant, brash young man – was a part of his identity, and had helped mold him into the successful Starfleet officer he had become. Although he was uncertain as to whether the experience had been real or simply a vision, Picard was grateful for Q's revelation. Also in 2369, Lieutenant Commander Nella Daren came aboard the Enterprise to become head of the ship's Stellar Sciences department. In her new role, she was very forthright in her requests for ship resources to support her department's studies. Soon after coming aboard, she and Picard met. A friendship quickly formed, based on their shared love for music. Daren accompanied the captain on a portable piano while he played the Ressikan flute. Their friendship soon blossomed into love. The crew reacted differently to Picard and Daren's romance: Deanna Troi was happy for Picard and gave her blessing; Beverly Crusher seemed jealous; and Riker felt that Daren was asking for special treatment because she was the captain's "girlfriend." When a fire storm threatened the Bersallis III Federation outpost, Daren suggested a plan to shield the outpost against the heat while the Enterprise evacuated the colonists. Eight crewmen lost their lives, but Daren survived. Afterward, it became obvious to Picard and Daren that it would be extremely difficult to continue their relationship while serving on the same ship, thus Daren requested a transfer. As they said goodbye, they promised to keep seeing each other, but knew their relationship would never be the same. There were some within Starfleet who blamed Picard for the destruction of the task force at Wolf 359. Benjamin Sisko, who was serving as first officer of the USS Saratoga at the time, lost his wife Jennifer in the attack. Picard and Sisko finally met in 2369, after the Enterprise was the first Starfleet vessel to arrive at Deep Space 9. Sisko was, at first, hostile toward Picard, but later came to forgive him. Sisko also gave Picard his letter of resignation, which Picard did not send, feeling Sisko was the right person for command of Deep Space 9. The individuality present in Hugh spread through the ship he returned to, causing a catastrophic separation of the ship from the rest of the Collective. This rogue mini-collective was unsure how to cope with its freedom, and so fell under the influence of the android Lore. Lore persuaded them to aid his plan to conquer Earth. Using the rogue ship, they attacked several outposts before being tracked down by the crew of the Enterprise-D. They destroyed the Borg ship and were able to persuade the remaining members of the mini-collective of Lore's unreliability. The mini-collective then disappeared into space and has not been encountered since. In 2370, Picard and Crusher were taken captive on the planet Kesprytt, and linked together by psi-wave devices in order to decrease their odds of escaping. The devices transmitted their thoughts to one another, where they learned each other's most intimate secrets. Crusher stayed up one night to listen to Picard's dreams, and Picard discovered that Crusher almost always had some biting comment at the ready, although she had learned to repress the urge to say them out loud. One night, Crusher brought up her late husband Jack, and feelings of guilt washed over Picard. She finally learned that he, too, felt an attraction, but did not act on it out of respect for his dead friend. Once they returned to the Enterprise, Picard expressed desire to further their relationship. However, Crusher ultimately decided that she did not want to ruin their friendship or be placed in a conflict of interest, and they decided to remain mutual friends. In 2370, Q returned to the Enterprise to continue the trial against Humanity. Claiming that the seven-year-old trial had never actually ended, Q proclaimed Humanity guilty of "being inferior" and informed Picard that his race was to be destroyed. He sent Picard traveling through time to his past, present, and future, where he was presented with a temporal paradox in the form of an eruption of anti-time in the Devron system. In this paradox, Picard himself was responsible for the creation of the anomaly that propagated backwards in normal time (anti-time having the opposite properties of normal time), thus destroying Humanity in the past. However, in addition to sending Picard jumping through time, Q also provided Picard with hints to understanding the nature of the paradox. Ultimately, Picard determined the solution and devised a way to close the anti-time anomaly in all three time periods. Following the captain's success, Q revealed that the entire experience had been a test, aimed at determining whether Humanity was capable of expanding its horizons to understand some of the advanced concepts of the universe. Departing, Q promised to continue watching Humanity, proclaiming that "The trial never ends." In 2371, the USS Enterprise-D was lost over Veridian III, with the vessel's primary hull crash-landing on the planet's surface. Picard also met the legendary James T. Kirk while in the Nexus with him, and recruited him in defeating and killing Doctor Tolian Soran before he could have the chance to destroy the Veridian system. There were no fatalities aboard the Enterprise, and most of the ship's senior crew was reassigned to the USS Enterprise-E, the sixth Federation starship to bear the name. Picard was installed as commanding officer and given a new authorization code: "Picard-4-7-alpha-tango." After a one-year shakedown cruise, the new Enterprise was nearly lost when the senior staff decided to sacrifice the ship in order to save Earth's future by preventing the Borg on board from changing history. In 2373, the Borg launched their second invasion of the Federation, and again the crew of the Enterprise played a major role in their defeat. Initially, the Enterprise was not to have participated in the Battle of Sector 001, because according to Starfleet Command, Picard would bring an "unstable element into a critical situation." Seeing that the Borg were getting the best of the fleet, Picard ordered the Enterprise to Earth to assist. He was instrumental in defeating both the main invasion and an attempt by the Borg to prevent the formation of the Federation by altering history. In late 2373, the Thallonian Empire in Sector 221-G collapsed and thousands of refugees were yearning to escape. The Enterprise was one of the first ships on the scene and was responsible for transporting refugees to Deep Space 5. On arrival at DS5, a meeting was held aboard the Enterprise, between Admirals Alynna Nechayev and Edward Jellico, Captain Picard, Commander Riker, Thallonian prince Si Cwan, and Danteri Ambassador Ryjaan. The meeting was to discuss the future of Thallonian space, to which all parties had different ideas. Captain Picard and Admiral Nechayev's suggestion was that a single Federation starship be assigned to the region, and with some negotiation, the plan was implemented. 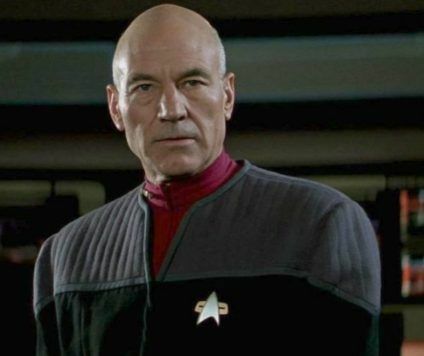 At Picard's suggestion, command of the ship in question, the USS Excalibur, was given to former Starfleet officer, Mackenzie Calhoun, whose commission was reinstated with the rank of captain. Two years later, in 2375, Picard ordered the Enterprise-E to the Ba'ku planet in the Briar Patch when it appeared that his operations officer, Lieutenant Commander Data, had malfunctioned and assaulted members of the research team there. Picard was able to capture Data and uncovered a plot by Admiral Matthew Dougherty, the Son'a and some in the Federation Council to relocate the Ba'ku against their will. Picard rebelled against Dougherty, bringing word of his actions to the public. Picard was able to protect the Ba'ku and stop Son'a leader Ru'afo from destroying the Ba'ku's homeworld. In April of 2376 the Enterprise was assigned to patrol near the Badlands in response to rumored Breen activity. Traveling aboard the Enterprise was Commander Elias Vaughn, who confided in Picard about his thoughts of retirement. Picard suggested Vaughn would not be happy sitting back and letting worlds go by, and suggested he turned to writing or teaching. After three weeks of the patrol, the Enterprise discovered a lost Cardassian freighter, the Kamal. Commander Vaughn led an away team to the freighter and discovered one of the lost Bajoran Orbs, the Orb of Memory, whose mind-affecting properties affected the entire away team. After recovering the Orb, Picard ordered a course set to starbase Deep Space 9 in the Bajoran sector, to return the Orb to the Bajoran people and have the Enterprise repaired after being damaged by the Badlands' plasma activity. The Enterprise arrived at the station in the aftermath of a Jem'Hadar assault, and a planned Federation Alliance assault on the Dominion. Picard had time to enjoy delivering the recovered orb to Kira Nerys before the Enterprise and station personnel were called into action again to stop a Jem'Hadar assault on the station's fusion core. After the crisis was averted, Vaughn chose to stay behind on DS9 and fill the vacant post of station's first officer. Before the Enterprise departed Picard suggested each Federation ship in the allied task force, which had arrived shortly after the incident, donate an energy generator to the station to provide power until a replacement for the fusion core, which was destroyed by the Jem'Hadar, could be found. Also before departing, Picard took the opportunity to make peace with Ro Laren, who was then serving as a chief of security on the station. In early 2376, beings claiming to be the ancient Iconians opened up their entire network of Gateways, and began offering the technology to the highest bidder. Captain Picard, given his prior experience with Iconian technology, was summoned back to Earth and conferred with Starfleet Command over the matter. Admiral William Ross temporarily re-assigned Picard to command the Saber-class USS Marco Polo on a mission to unite the Alpha Quadrant powers against the "Iconians". Picard and Deanna Troi managed to assemble a fleet of seventeen vessels from various races to confront the "Iconians". During the confrontation, Picard discovered that, as suspected, these aliens were not the Iconians at all, but rather a race known as the Petraw. Picard discovered that, although the Petraw figured out how to activate the Gateways network, they did not know how to shut it down. In an act of desperation, Picard stepped through a gateway aboard the Petraw ship in an attempt to make contact with the real Iconians. Upon meeting the real Iconians, Picard learned that they employed a non-intervention policy similar to the Prime Directive, and would not intervene in the matter. They did, however, send Picard to a world where the systems Master Resonator was located, which would close down the Gateway system. On the world, Picard managed to obtain all of the resonator keys and was returned to the bridge of the Enterprise. The various keys were sent to different ships, and the ships were sent to specific gateways. The simultaneous use of the keys at the various gateway locations shut down the system, ending the threat. In early 2378, Picard was one of several Starfleet officers present at the first official debriefing of Captain Kathryn Janeway after her ship, the USS Voyager returned from the Delta Quadrant. Picard was also on the short list of high-ranking officers that may have been involved in the sale of intelligence and technology to the Orion Syndicate. In 2378, the Enterprise, along with the USS Juno, was assigned to patrol against pirates and scavengers at the site of the Battle of Rashanar, one of the deadliest conflicts of the Dominion War. From the start the mission, things went wrong for Picard and the Enterprise. First, the captain's yacht, the Calypso, was stolen by the Androssi, and then the Enterprise had to deal with the strange anomalies in the region. Acting solely on the word of his second officer, Data, Picard ordered an attack on what appeared to be the Ontailian heavy cruiser Vuxhal. In response to the attack, the Ontailians destroyed the Juno with all hands. Upon returning to Earth, Picard's competence as captain was called into question. Picard was relieved, and Riker assumed command. Picard was eventually allowed to return to the Enterprise under the supervision of Counselor Colleen Cabot, but only in the role of observer. On Admiral Nechayev's orders the Enterprise returned to Rashanar and discovered that the "Onatailian" ship that they had destroyed was actually a shapeshifting creature. With some help from the Traveler, the Enterprise vanquished the creature. Picard re-assumed command of the Enterprise. However, in order to save face with the Ontailian government and preserve their Federation membership, "official" blame still fell on the shoulders of Picard. Now in poor favor with Starfleet Command, Picard was ordered by Admiral Nechayev to investigate a 200-year-old distress signal sent by the Dokaalan. Starfleet fully expected the race to be long doomed, as the Dokalaan homeworld was breaking apart at the time of the signal. However, it was felt that the current political atmosphere of the Federation would benefit if the "tainted" Captain Picard were far away. Upon arriving at the Dokaaalan system, Picard was astonished to find that a portion of the Dokaalan people had managed to save themselves in a series of asteroid outposts. Picard offered the service of the Federation to assist in their efforts to terraform another planet in the system to their needs, and uncovered a plot by the Satarrans to steal that world from them. The Enterprise was then ordered to the distant planet of Delta Sigma IV, a world co-inhabited by the Bader and the Dorset, two races that had traditionally been adversaries. When it was discovered that a Starfleet-created medication was restoring the aggressive natures of the two races, cancelling the calming effect of the planets atmosphere, Picard, Riker, and Riker's father Kyle Riker struggled to find a workable solution. When Kinchawn, the ruler of a minor world named Tezwa threatened war with the Klingon Empire, Picard and the Enterprise were sent in to mediate. Kinchawn, however, was not interested in mediation. He attacked the Klingon fleet with an advanced nadion-pulse cannons, which killed over 6,000 warriors. The weapons were of Federation origin, and Picard was ordered to take the planet out from under the nose of the Klingons, and destroy the weapons. To this end, Picard contacted Ambassador Worf, his former chief of security. Worf obtained the command codes for the Klingon fleet and provided them to Picard, which enabled him to defeat the Klingon fleet without ever firing a shot. After the removal of Kinchawn, who managed to escape custody, the Enterprise remained at Tezwa acting as peacekeepers in the unstable region. an action made more difficult by the insurgency started by Kinchawn and his loyalists. Picard and his crew eventually managed to trace the origins of the nadion pulse cannons all the way to the office of Koll Azernal, Chief of Staff to Federation President, Min Zife. Picard, and those of his crew who knew the truth, agreed to maintain their silence on the matter, as if it were to be discovered that 6,000 Klingons had died due to orders of the Federation President, war with the Klingon Empire would have been inevitable. Soon after, Zife resigned from office, and disappeared from public view. A year after the Rashanar incident, the Enterprise, and Picard in particular were forced to endure a grueling inspection from Starfleet Command. The inspection team included Captain Wai-Lin Go, Doctor Toby Russell and Betazoid Sabin Genestra, all of whom had some sort of personal grudge against Picard or his crew. The legendary Montgomery Scott, fearing that Starfleet was putting together a "stacked deck," volunteered for the last spot on the inspection team. The Enterprise and crew passed the inspection with flying colors, and were returned to grace with Starfleet Command. Soon after, the Enterprise was assigned to help the Klingon Empire find their missing Emperor, who had replaced himself with a hologram, and found a secluded world on which he could pass his days painting landscapes. Picard continued in command of the Enterprise through 2379, when the ship was sent to Romulus after the coup by Praetor Shinzon. Shinzon was a clone of Picard created by a former Romulan government – they intended to replace the captain with a spy of their own. Following a change of government and concern that it would lead to war, the plan was abandoned and Shinzon was sent to Remus to die. Instead, he prospered, becoming a highly successful leader during the Dominion War. Shinzon used a thalaron radiation weapon to eradicate the Romulan Senate and had planned to do the same to Earth. He needed Picard in order to repair faults in his own genetic makeup. In a pitched battle between the Enterprise and Shinzon's flagship, the Scimitar, Picard was eventually able to board the enemy ship and eliminate Shinzon. The incident with Shinzon was the final straw for Picard and he was demoted to Lieutenant Commander. Feeling his options were limited he took the Second Officer position on the USS Curie to serve under the duplicate of his best friend who barely knew him.